Here at Lockaway Storage, we know our success is due to our wonderful team. The care they give our renters is unparalleled and we want to highlight their milestones along the way. Below is an interview with Chad Hunt, celebrating his 13th year! 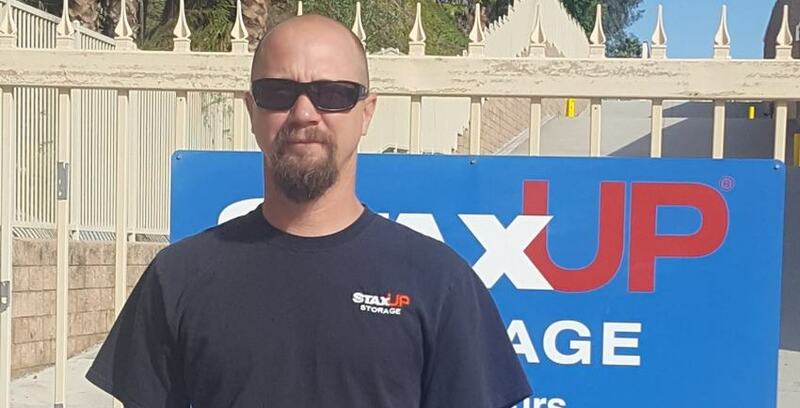 Chad Hunt is a District Manager for StaxUP Storage in Southern California. Colby: Chad, you are a District Manager, correct? Chad: I just celebrated my 13th anniversary. Colby: Were you always a DM, did your work your way up? How did that work out? Chad: I started as the Manager for Diablo Mini Storage, and then from there sort of worked my way up to manager here at San Marcos, and then District Manager. Colby: Take me back 13 years ago. What was it that made you originally apply for the company? Was there something about it that stood out to you? Chad: Well, I was a Manager over in Corona, California, and my sister already worked for the company. She was like, “Hey we have a position open why don’t you take a look?” So I applied and started talking with Walter and really liked the way the company was laid out and how they did things. Colby: Very cool. Well, I’ve definitely got a lot of positive responses about the company culture. From the maintenance guys all the way up to upper management. Is there a particular story you tell if somebody ever asks you what it’s like working there? Chad: Yeah, part of what I do as a district manager is teaching people when they first come on how to be a part of our culture. How we do things, how we have a very open door policy. You can talk to anyone in the company. We all work together as much as possible. It’s one of the things I like to reinforce right off the bat with people, because it’s one of the things that really helped me stick with and grow with the company. Just how we are able to stick together and solve problems as a team. Colby: What would you say is the biggest thing you learned about the industry over 13 years? Chad: Oh gosh, I have learned so much. One of the biggest things I have learned is how fast this industry is growing and how much it’s grown, and at the same time how small it is. While it’s a huge industry, if you ever go to the CSSA meetings or SSA in Vegas, everyone knows everybody. It’s a very tight community. Colby: Stepping outside the self storage industry for a minute. What are your favorite things to do, like hobbies and what not, when you are not at work? Chad: If I am not fishing, I am off-roading. Those are my two biggest hobbies. Colby: What kind of fish do you go after? Is there a certain fish you try to catch? Chad: Yeah, I would say I do a lot of offshore fishing. Tuna fishing is kind of my big thing, I love being offshore 30 or 40 miles and fishing for big tuna. Colby: Yeah? Right on. If you aren’t catching some tuna, what’s your favorite place to go to get a bite to eat? Chad: You know, I really like Joe’s Crab shack down by Oceanside. It’s a nice place, its right by the water, and it overlooks all the boats. So if you aren’t out there fishing, you can have a beer and dream about being out on the boats. Colby: There you go. Is there anybody you would like to give a shout out to in celebration of year 13? Chad: Let’s give a shout out to Julie. She has really helped me grow and learn, not only the industry, but my job as district manager. She has been by my side the whole way and we’ve been in this together.